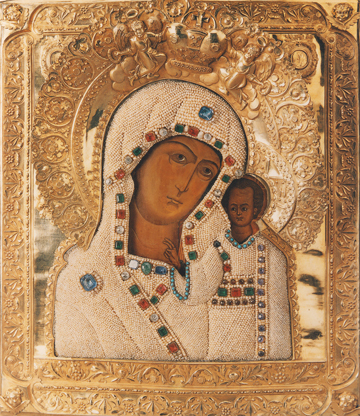 This ornate icon of the “Theotokos” (from the Greek, literally “Birth-Giver of God”) is of the icon style called “Kazanskaya” or “of Kazan” after the original icon found in Russia in the 16th century. A maiden named Matrona was visited in dreams by the Theotokos, who told her to get the Archbishop to find her icon in a certain location. After the third such message, a group of people, led by the Archbishop began digging in the spot indicated in the dream, but to no avail. Finally they let young Matrona try and she found the icon, wrapped in red cloth, in her first shovel full of earth, on July eighth. The icon was triumphantly carried in procession to the nearest church but later moved to the Cathedral. This original is greatly revered by the Russian people. In the copy here we see the Virgin near the Lord Who is standing upright next to her and has His right hand extended in blessing. This icon is encrusted in precious pearls and jewels and covered with a riza, a metal gold-plated cover to protect and beautify the image. The Lord’s face is looking inward, but the Virgin is looking right at us inviting us to look at her Son and our God.